Sambucus ebulus is a native botany and exists in large amount in Iran and consists of anti-cancer substances such as ebulin (RIP-II, ribosome inactivated protein-II), flavonoids, etc. Isolation and identification of some potent anti-tumor compounds from medicinal plants, has motivated researchers to screen different parts of plant species for anti-tumor effects. In previous studies, anti-inflammatory effects of n-hexane and methanolic extracts of S. ebulus , nephro- and hepato-toxic effects of ethylacetate extract of this plant and evaluation of role of vitamins C and E on prevention of cellular and pathological disorders induced by the ethyl acetate extract was performed and reported. So, cytotoxic activity and IC50 of specific concentrations of ethyl acetate extract of fruits of S.ebulus on 4 normal and cancer cell lines was studied. Also, Etoposide, a chemotherapeutic drug, was administered to control positive group. The normal cell lines were CHO and rat fibroblast and cancer cell lines were HepG2 and CT26. The cytotoxic effects and IC50 of the extract on the cell lines were studied followed by MTT assay. The results showed that the ethyl acetate extract of Sambucus ebulus possesses lower IC50 in the cancer cell lines in comparison with the normal cell lines. On the other hand, the extract possesses higher IC 50 in comparison with Etoposide on all 4 normal and cancer cell lines (P<0.05), but it manifested a good cytotoxic compound which can introduce as an anticancer compound. At present time utilization of pharmaceutical plants (especially native plants) in treatment of diseases has been specifi c importance. Isolation and identification of some potent anti-tumor compounds, such as colchicine, Vinca alkaloids, taxol and etc., as natural anticancer compounds, has encouraged scientists to screen different parts of plant species against cancer cell lines ,,, . While the plant S.ebulus (Caprifoliaceae L.) is a native botany, exists in large amount in Iran and consists of anticancer substances, such as ebulin (RIP-II, ribosome inactivated protein-II), also flavonoids, steroid substances, cardiac glycosides, tannins, caffeic acid derivatives and other isolated substances ,,,,, . According to our previous investigations, we observed the anti-inflammatory effects of n-hexane and methanol extracts of S.ebulus , and renal and hepato-toxic effects of ethyl acetate extract of fruits of this plant in mice; and the evaluation of role of vitamins C and E, as anti-oxidant compounds on prevention of cellular and pathological disorders which were produced by ethyl acetate extract of S.ebulus was performed , . Thus, we decided to study the IC50 and cytotoxic effects of ethyl acetate extract of Sambucus ebulus on normal (CHO and rat fibroblast cell lines) and cancer cell lines (HepG2 and CT26 cell lines), and compare the parameters with the results concluded from cytotoxic effect of Etoposide on theses cell lines. Fruits of Sambucus ebulus were collected from the Farah Abad region, Sari (Mazandaran province, Iran) in June 2007. 50 g of the fruits was chopped and soaked in 150 ml of ethyl acetate for 48 hours and then perculated (5 hours, 30 drops/min)  . The extracts were concentrated by rotary evaporator, and the specific concentrations of the ethyl acetate extract (5, 25, 50, 100, 150, 25, 500 and 1000 μg/ml) were prepared using DMSO solvent and DMEM media (1:19). CHO (Normal Chinese hamster ovarian cells), normal rat fibroblast, HepG2 (Human hepatocarcinoma) and CT26 (Human colon carcinoma) cell lines were purchased from Pasture Institute of Iran in Tehran. This completed media was sterilized by 0.22 μm microbiological filters and kept at 4°C before use. In MTT assay, 50 μl of DMEM/F12 including 1Χ10 5 cells were added to 3 wells for each concentration of the extract and Etoposide. Then, they incubated for 72 hours. After incubation, the cell lines were exposured to 50 μl of each 0, solvent (DMSO), 5, 25, 50, 100, 150, 25, 500 and 1000 μg/ml of ethyl acetate extract of S.ebulus and 0, 5, 25, 50, 100 μg/ml of Etoposide for 72 hours, and then washed using sterile normal saline 0.09%. After this period, the contents of wells were excluded; the cells were dyed by 30 μl of MTT (Methyl thiotetrazolium) and incubated for 4 hours. Then, MTT solution was excluded from wells, and 30 μl of DMSO was added to each well and the 96 well/plates were shaked for 15 minutes. At the end, the absorbance was determined by ELISA reader (λ max =490 and 630 nm). Prism ver.3 Software was used to perform statistical tests. Analysis of variance (one-way ANOVA) followed by Tukey test was used to determine the differences among the groups (p<0.05). The results are prepared in [Table 1] . The results showed that the extract of Sambucus ebulus possesses higher IC50 in comparison with Etoposide on all 4 normal and cancer cell lines (P<0.05); the lower IC50 represent the higher potency of a compound to inhibit the growth of cells and cause toxicity and death of cells. But, the study manifested a good cytotoxic compound which can introduce as an anticancer compound which was toxic in the cell lines. The lowest and highest IC50 of the extract was evaluated on HepG2 (97.03 μg/ml±1.52) and CHO (346.2 μg/ ml±3.02) cell lines; also, IC50 of the extract on normal cell lines was higher than that in cancer cell lines. This order was similar to the order of IC50 of Etoposide on normal and cancer cell lines. Diagrams 1 to 5 shows the IC50 of ethyl acetate extract of S.ebulus and Etoposide on the cell lines. The order of IC50 of Etoposide in the 4 cell lines was: Fibroblast > CHO > CT26 > HepG2. On the other hand, the order of IC50 of the ethyl acetate extract of Sambucus ebulus in the 4 cell lines was: CHO > Fibroblast > CT26 > HepG2. Otherwise, the viability percent (50%) of HepG2 and CT26 cells treated with the extract (orderly 97.03 and 152.70 μg/ml) was similarly closed to 2.80 and 3.89 μg/ml of Etoposide. 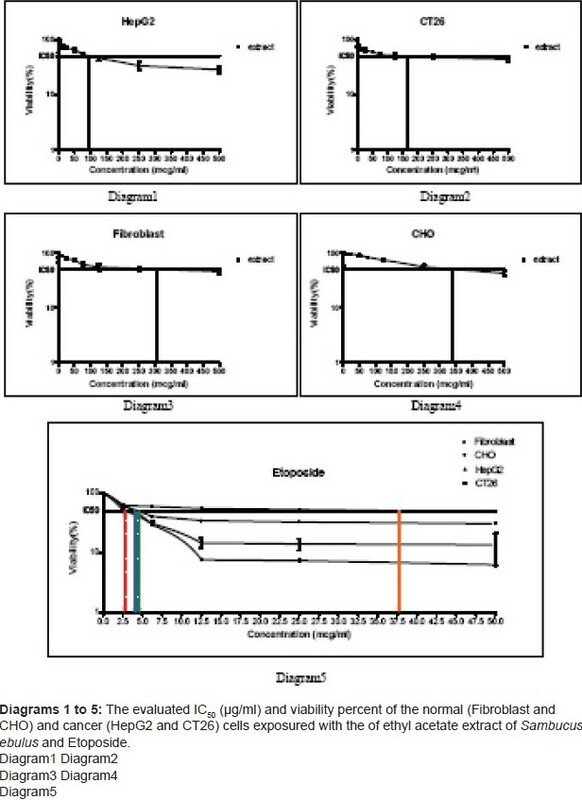 Also, the viability percent (50%) of CHO and Fibroblast cells treated with the extract (orderly 346.2 and 312.29 μg/ml) was similarly closed to 4.375 and 37.5 μg/ml of Etoposide. According to the results, IC50 of the extract and Etoposide, as positive control compound, on normal cell lines were higher than that on cancer cell lines. This difference can be resulted from dysfunction of cellular organisms following cancer incidence which cause higher rate of proliferation and increased cellular intake. Also, defend disorders and effusion insufficiency to escape toxic substances can lead to lower amounts of cytotoxic compounds to inhibit the growth of cancer cells in comparison with normal cells. On the other hand, the extract possesses higher IC50 in comparison with Etoposide on all 4 normal and cancer cell lines (P<0.05); but, comparison of IC50 and viability percent of the cells exposured with the extract of Sambucus ebulus with Etoposide, as a common chemotherapeutic drug, allows us to conclude that extract of fruits of Sambucus ebulus is a good candidate for further studies of activity-monitored fractionation to identify their active components. This study was supported by a grant from the vicechancellor of research of Mazandaran University of Medical Sciences, Sari, Iran. 1. Huang C.H. , Kingston D.G. , Magri N.F. , Samaranayake G. and Boettner F.E. New taxanes from Taxus brevifolia . J Nat Prod. 49 ( 4 ): 665 - 9 ( 1986 ). 2. Van Uden W. , Homan B. , Woerdenbag H.J. , Pras N. , Malingre T.M. , Wichers H.J. and Harkes M. Isolation, purification, and cytotoxicity of 5-methoxypodophyllotoxin, a lignan from a root culture of Linum flavum . J Nat Prod. 55 ( 1 ): 102 - 10 ( 1992 ). 3. Prasain J.K. , Stefanowicz P. , Kiyota T. , Habeichi F. and Konishi Y. Taxines from the needles of Taxus wallichiana . Phytochem. 58 ( 8 ): 1167 - 70 ( 2001 ). 4. Jafarian-Dehkordi A. , Emami S.A. , Saeidi M. and Sadeghi H. Cytotoxicologic Studies of the Extracts of Iranian Juniperus Sabina and Platycladus orientalis on Cancer Cells . J Res Med Sci. 5 : 205 - 9 ( 2004 ). 5. Ahmadiani A. , Fereidoni M. , Semnanian S. , Kamalinejad M. and Saremi S. Antinociceptive and Anti-inflammatory Effects of Sambucus Ebulus Rhizome Extract In Rats . J Ethnopharmacol . 61 : 229 - 35 ( 1998 ). 6. Ghannadi A.R. and Ghassemi-Dehkordi N. Pharmacognostical Investigations on Sambucus ebulus L. and Sambucus nigra L. Daru. 7 ( 1 ): 55 ( 1997 ). 7. de Benito F.M. , Citores L. , Iglesias R. , Ferreras J.M. and Soriano F. Ebulitins: A new family of type 1 ribosome-inactivating proteins (rRNA Nglycosidases) from leaves of Sambucus ebulus L. that coexist with the type 2 ribosome-inactivating protein ebulin 1 . FEBS Letters . 360 ( 3 ): 299 - 302 ( 1995 ). 8. Pribela A. , Durcanska J. , Piry J. and Karovicova J. Volatile substances of dwarf elder Sambucus ebulus L. fruits . Biologia (Bratislava) . 47 ( 3 ): 225 - 30 ( 1992 ). 9. Petkov V. A source of ideas for phytopharmacological investigations . J Ethnopharmacol . 15 : 121 - 32 ( 1986 ). 10. Ebrahimzadeh M.A. , Mahmoudi M. , Karami M. , Saeedi Saravi S.S. , Ahmadi A.H. and Salimi E. Separation of active and toxic portions in Sambucus ebulus . Pakistan J Biol Sci. 10 ( 22 ): 4171 - 3 ( 2007 ). 11. Saeedi Saravi S.S. , Shokrzadeh M. The Study of Hepatic and Renal Disorders in Mice Which Were Administered Ethyl Acetate Extract of Plant Sambucus ebulus Intraperituenally (IP) and Effect of vitamins C and E on prevention of Its Disorders . Toxicol Letters . 45th Congress of EUROTOX ,180S : S57 ( 2008 ). 12. Prasad S.B. and Giri A. Antitumor effect of cisplatin against murine ascites Dalton's lymphoma . Indian J Exp Biol. 32 : 57 - 62 ( 1994 ). 4 Oxidative damage induced by retching; antiemetic and neuroprotective role of Sambucus ebulus L.
Shokrzadeh, M. and Badali, H. and Yazdani, J. and Amiri, Z. and Omidi, M.
Shokrzadeh, M., Azadbakht, M., Ahangar, N., Hashemi, A., Saeedi Saravi, S.S.
Shokrzadeh, M., Azadbakht, M., Ahangar, N., Naderi, H., Saeedi Saravi, S.S.